Stephen Hollen performs as Mark Twain on Sunday during the Inland Waterways Festival in Marietta. 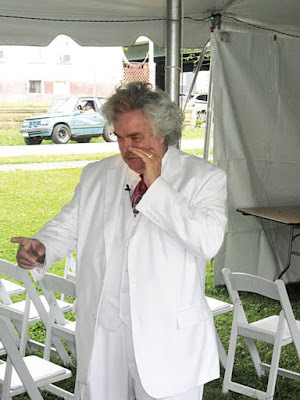 Stephen Hollen is a humorist, storyteller, performer, writer and poet... and a Mark Twain Impersonator. Stephen became a "Twainiac" some time ago when he began to read Twain's books. The irony and wit Twain as a Humorist had as he appeared on stage shows forth easily in his speeches and lectures. Stephen's early influences as a humorist arose from his childhood in the hills of Eastern Kentucky and his love for the richness of humorist like Twain and Will Rogers. 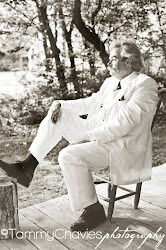 It was simply serendipity that led Stephen Hollen to impersonate Mark Twain. The first time someone told him he looked like Twain, he simply smiled. After it happened dozens of times, someone finally said. "you know... you like to tell stories, you look like Mark Twain and you love his wit... why not be Twain?" It was a great idea that opens the door for you to invite Mark Twain, Storyteller to your event, school or organization for a visit and perhaps a lecture. Call Stephen for details at 937-371-4071.